Model 1 takes the pure water model and adds HCl (blue above) via hydrogen bonding to the H2O that is transferring the proton to the indole ring. Three water molecules are hydrogen bonding to the carboxylate oxygens to create a bicyclic network in which a ring of either 8 or 10 atoms can act as the proton relay structure. The question now arises whether the proton relay takes the longer (red) route or the slightly shorter green route. Isomeric model 2 uses H3O+ for proton transfer, with an adjacent Cl– to complete the ion-pair. ‡Reactant as a non-ionised covalent HCl. 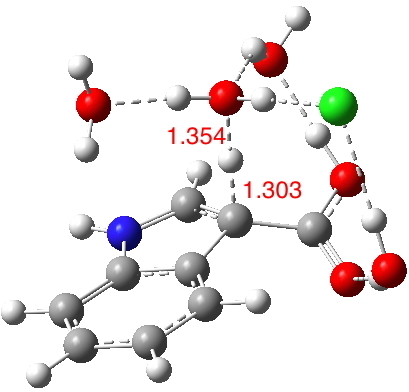 †reactant as an isomeric ionized H3O+.Cl– beng 2.0 kcal/mol higher in energ within this solvation model. Note added in proof. A significantly lower form of the reactant has subsequently been located which increases the free energy barrier to 22.1 kcal (vis 22.0 actually measured!). Diacussion of this can be seen in the associated post here. An IRC for Model 1 shows that the proton relay takes the red path, whereas without the HCl the green path is followed. The transition state free energy however is ..
10.6‡ or 12.6† kcal/mol higher than model 2 (click on the image below to load a 3D model). The general acid catalysed model is therefore preferred. The difference in free energy between the two models corresponds to a rate acceleration of >106, which is indeed similar to that observed. The clincher comes with calculation of the kinetic isotope effects (KIE). For general acid catalysis, they were measured as kH/kD ~2.5. For model 1, using an un-ionised reactant and un-ionised transition state, the calculated KIE is 5.69 (very similar to that calculated for the water catalysed reaction, 5.66) but not a good fit to experiment. For model 2, using the same un-ionised reactant but an ionised transition state, KIE = 2.04, a much better fit. For model 2, using ionised reactant AND transition state, KIE = 2.45, an even better fit to experiment. So we now have a model for the general acid catalysed decarboxylation of a 3-indole carboxylate which agrees with both the kinetic behaviours and the isotope effects measured for this reaction. Since the barrier is a relatively large one, proton tunnelling may play a lesser role in this interpretation, and the stage is set to use this model to e.g. explore how isotope effects are indeed influenced by tuning the reactivity using ring substitutents, the original purpose of my researches all those years ago. Perhaps the catch phrase I’ve started so I’ll start is now more apposite. This entry was posted on Sunday, January 10th, 2016 at 9:00 am and is filed under Interesting chemistry. You can follow any responses to this entry through the RSS 2.0 feed. You can leave a response, or trackback from your own site. "I've searched, so now I'll re-search."